We live in THE most economically challenging time in history. With the advent of the computer over the last 30 years, traditional thinking, jobs, careers, ways of learning, have all changed forever. We now compete with over 7 BILLION humans across the globe who are also trying to feed their families like you and me. In this ever-changing and advancing world, the competition will ensure that if we don’t first keep up and then outperform that vast world of competitors, we are guaranteed to be left behind. Over the last year we have been discussing a strategy to enable the fulfillment of your lifestyle, career and business ambitions. This last part called “reading the world” might as well be the first part because without the ability to anticipate change and be on the leading edge of new solutions you may design a strategy that is obsolete before you even launch. Interested to know what this “reading the world” is and why it’s so important? Changes to every industry are occurring at a “blurring pace”. Market Place drift is what we define as the continuous appearance of new concerns, situations, and practices. Market Place drift is when something like the VCR is replaced with the DVD or Blockbuster video is rendered obsolete (marginalized) by Netflix practically overnight. There is no question of if Market Place drift will hit — it’s unstoppable—so the question becomes when it will hit. What’s exciting is you can anticipate and move away from the threat while aiming toward the opportunities that come with drift. Market Place drift can be caused by new technologies (smart phone, i-pad); new laws and rules (Obamacare); new economic and demographic situations (baby boomers or millennials) and new offers and practices made by competitors. Over time all offers become common and people price them (e.g. will not pay a premium). When was the last time you saw “roll-up” windows in a car? I’m old enough to remember when power windows were a luxury item in an automobile but now they’re pretty much standard equipment without a premium charge. Seat belts were also an option you had to pay extra for when they first came on the scene! Once we accept Market Place drift as reality (e.g. something that affects our concerns whether we accept it or not like gravity, the price of milk, and the fact that we get old and can’t work) we can develop strategies to cope with it. We can gain new knowledge or work with others that are experts in emerging fields. Building Information Modeling (BIM) has been around since 2000, yet it’s still in its adoption infancy. I see tradesmen in the field scoff at its validity and potential rightfully so. But I wonder…is this the same mentality that prevailed when the battery drill first hit jobsites? The adoption of new technology like BIM in combination with things like Total Station will reduce layout and installation time significantly in the near future. However, the one significant challenge with the adoption of this technology is most BIM technicians are computer people who are learning to design construction put in place in a virtual world. What would happen if a senior journeyman learned the computer skills to harness the vast field knowledge that a computer operator could never gain, and become a BIM operator or designer? AND what if a field worker was to accept that change happens and be the first in his company to be trained and proficient with this new layout technology? What do you think would happen to their position in the company? What do you think is possible for that company to accomplish? 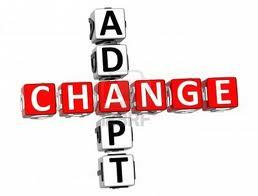 It’s the people that accept, anticipate and invite change that have the opportunity to be first, move fast, persist and win in this crazy world that we live in today. In closing it has been a real pleasure to share my strategic thinking with you over the last 12 months. I would love to hear from you! Where were you stimulated into new thinking and conversations with your networks of family, co-workers, and friends? What strategic moves are you planning to make? If I can be of further assistance please don’t hesitate to contact me at rek@jencoinc.com.